Dubai, UAE, October 31, 2018: His Excellency Dr Ashraf Sobhy, Egypt’s Minister of Youth and Sports, says his ministry has put plans in place to use football star Mohamed Salah’s stunning success as a blueprint and create many more “Mo Salah” for the future. “We have put plans in place for academies and football clubs to create a number of Mo Salah in the coming years,” said Dr Sobhy, as he launched the 14th edition of the Dubai International Sports Creativity Symposium at the Mina Al Salam hotel on Wednesday with a presentation titled “Youth and Sports – Future Prospects”. 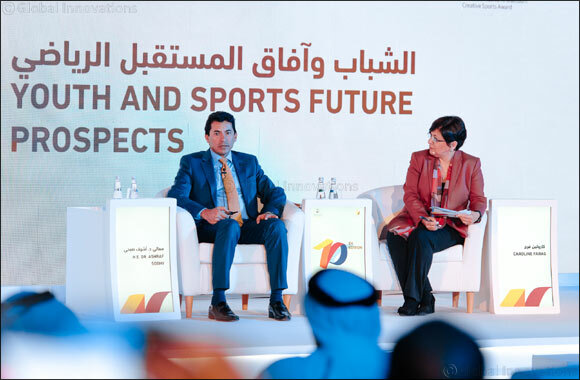 Organised by the Mohammed Bin Rashid Al Maktoum Creative Sports Award, which is one of the Mohammed Bin Rashid Al Maktoum Global Initiatives, the 14th Dubai International Sports Creativity Symposium was held under the theme “Empowerment of Youth in Sports”. H.E. Matar Al Tayer, Vice Chairman of Dubai Sports Council and Chairman of the Mohammed Bin Rashid Al Maktoum Creative Sports Awards’ Board of Trustees, was present at the Symposium along with H.E. Saeed Hareb, Secretary General of Dubai Sports Council, Moza Al Marri, a Board Member of DSC and Secretary General of the Awards, and Nasser Aman Al Rahma, Assistant Secretary General of the DSC, and a number of other dignitaries. In the second session, titled “Outstanding Stories”, Egyptian Modern Pentathlete Aya Medany, who has participated in three Olympic Games, and Dr Huda Al Matroushi, a member of Asian Fencing Federation’s Executive Board, shared their experience, while Caroline Baxter Tresise, a consultant on youth and sports at UNESCO, gave a presentation in the third session titled “Empowerment of Youth International Organisations”. Salah has risen rapidly up the popularity charts since moving to Liverpool from Roma in the summer of 2017. A sensational debut season, the Egypt international broke Liverpool’s scoring record for a debut season with 32 goals in 36 Premier League games, a feat which helped him win the League’s Golden Boot for the season. Salah also became the first player to win three Premier League Player of the Month awards in the same season and his record-breaking performances saw him receive a number of other accolades at the end of the 2017–18 season, including the PFA Players' Player of the Year, the Football Writers' Player of the Year and the PFA Fans' Player of the Year awards. He also made it to the three-man shortlist for the 2018 Best FIFA Men's Player award, and eventually finished third behind Croatian Luka Modric and Cristiano Ronaldo of Portugal. Creating those opportunities, Dr Sobha said, will be crucial in the future. “We have to think out of the box,” he said. “Come up with audacious ideas and innovate. We have to show strategic intent. “We also need to find out what our youth want – we need to know their version in order to channel their talents in the right direction.